How about eating our burgers or tacos while watching the view of Yokosuka? or visiting the Yokosuka Naval Base on an open day. 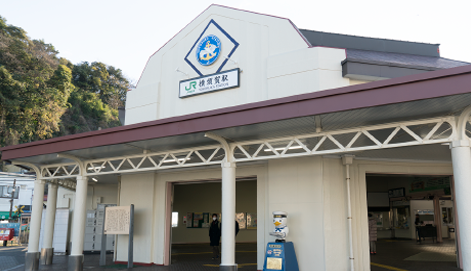 JR Yokosuka station has maintained its second-generation station building ever since it was established. Verny (French architect) introduced the French style garden to this park which was established at the end of 2001. 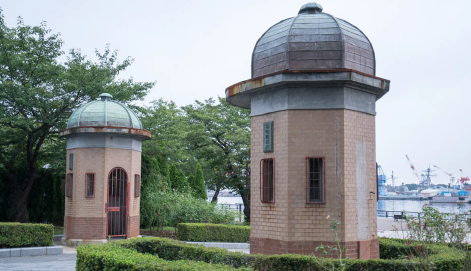 If you take a look on the opposite side of the park, you can enjoy the view of Yokosuka Steel Works which was constructed in honor of Verny and also Verny-Oguri Memorial Ceremony. This park is consisted of French style flower beds, water fountains and a western-style summerhouse. About 1400 seedlings of 130 varieties of roses (mainly French) add a beautiful touch to this park. You can even enjoy the walk on the wooden boardwalk along the shoreline with a sea breeze. Yokosuka port is well-known for the existence of both US naval base (Yokosuka port) and Japan’s Maritime Self Defence Forces’ commander (Nagaura port). 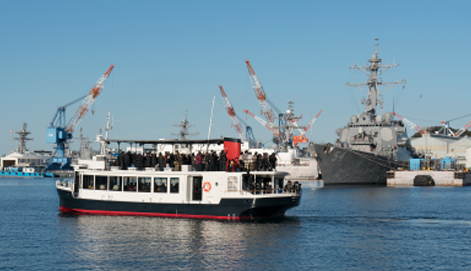 Triangle, Inc. offers a “Yokosuka Naval Port Cruise” daily and they will take you to the historical sites including these two ports. 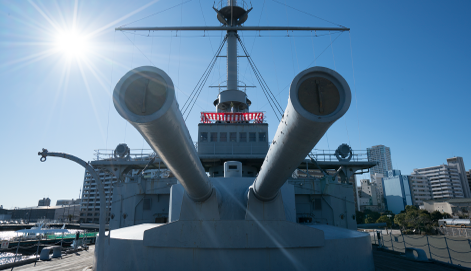 Through this port cruise you will see both American and Japanese battleships at a close distance, which in Japan you will never get to find except in Yokosuka. 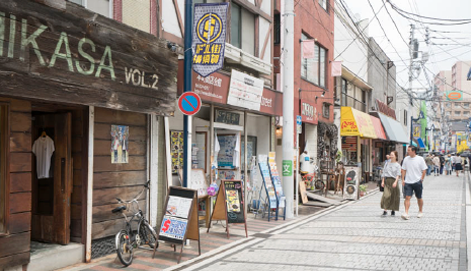 “Dobuita Street” is where you can feel a mixture of American and Japanese atmosphere. There are various shops in this total length 300m of shopping street. You can see unique events throughout the year here. This is the gate of Yokosuka Naval Base and is located near Mikasa Park. The easiest access is from Yokosuka Chuo station (Keikyu line). 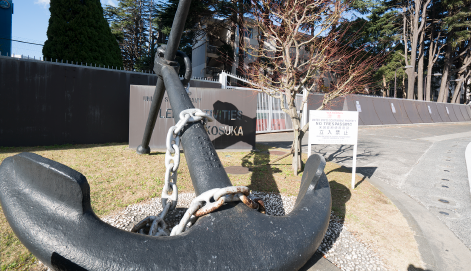 There are a few events every year such as U.S. & Japan Friendly Relationship History Tour and Navy Friendship Day which the public is allowed to access to the base. 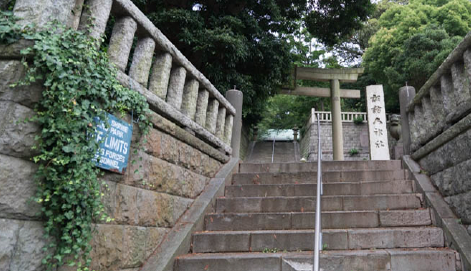 This shrine was built in 1380 and has been loved by locals since then. It’s a 4 minute walk from Shioiri station (Keikyu line). You will see a set of stone walls as you enter, and over 170 year old stone-carved guardian dogs will welcome you near the decorative fences in the lower level. Both the stone pillar and the front guard frame can be found in the center of the grounds, and on the side of the entrance path there is a dedicated lantern that’s rarely seen. This representative park of the city is nominated for “The 100 best city parks in Japan” and “The 100 best historical parks in Japan”. Based on its theme, “water, light, and sound”, the show of small and large water fountains are seen every day and they get illuminated in the evening. You can also find dynamic wall fountains, an 18 meter height monument and the murmur of the stream gives visitors peacefulness. 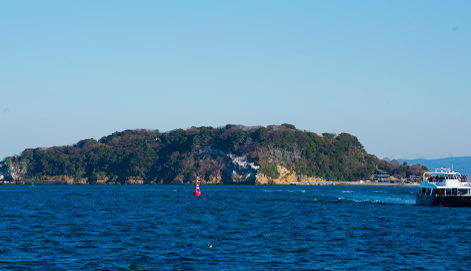 Saru-shima is the only desert island in Tokyo Bay. You can enjoy attractions such as the historical heritage walk into the remains of forts and ammunition chambers, sea bathing and BBQ facilities that are also available on this island. And it’s an easy access from Mikasa Park and only 10 minutes by ship! *no monkeys inhabit this island.